This 6-week, 5 day/week training plan is sport-specifically designed to prepare snowmobile athletes for the mountain sledding season by specifically addressing these fitness demands. 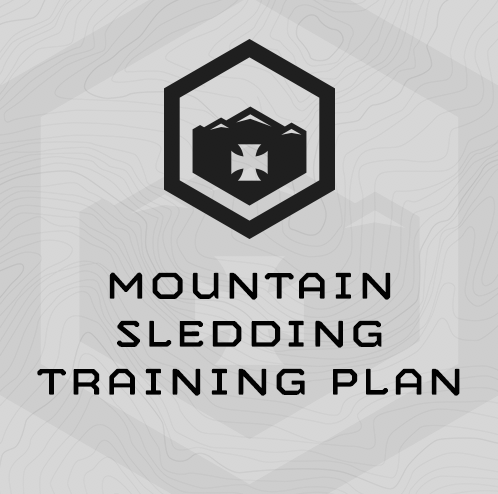 This plan is designed to be completed the 6 weeks directly before your mountain sledding season begins. Build Lower Body Strength and strength endurance for shifting weight back and forth across the seat, as well as digging out and lifting stuck sleds. Build Grip Strength and grip strength endurance for long days working the throttle and handle bars. Build All around mid-section strength and strength endurance, especially isometric, rotational and extension strength. Build Upper body strength and strength endurance with a single limb and rotational component. Build Multi-modal work capacity for intense top marking efforts. Build Multi-modal endurance for dawn to dusk days of mountain sledding. This is a progressive, very intense, 6-week, gym-based training program. You will train 5 days/week for a total of 30 training sessions. The intention is that Monday through Thursday are are training days. Friday, Saturday and Sunday are rest days. This training program is designed to be completed any commercial gym, with basic equipment. The only unique piece of equipment needed to complete the program is a sandbag. Men will need a 60 pound sandbag, and women will need a 40 pound sandbag. Generally around 60 minutes, though near the end of the program, training sessions may take up to 75 minutes. What if I can’t keep up the Monday to Friday Training Schedule? The days you train are not as important as completing the training sessions sequentially and taking 2 full day’s rest between weeks. Drop, or “scale” the load or weight as necessary to meet the prescribed number of reps. For example, if the training session calls for 5x Bench Press @ 135# and this is too, heavy, drop down to 115#, – or whatever is required, to get 5 reps.
What if I’ve never training in a gym before? This training program is going to be quite an adventure in athletic training for you! Wednesday’s strength work is built primarily around classic barbell exercises. These are not complicated exercises, but they can be awkward at first. If needed, you can seek exercise instruction from a local coach or personal trainer. You can also teach yourself these exercises by being patient, using lighter weights, and sticking with it. Practice helps! There are many web-based sites and resources to find information on performing these common exercises. You’re not helpless. Be resourceful. What about exercises unique to MTI? Fully Equipped gym including barbells, plates, squats racks, dumbbells. 14-16″ Box or bench for hippity hops and step ups and a Sandbag: 60# for men. 40# Sandbag for women. 6 days/week – eat as much meat, vegetables, fruit, seeds and nuts as you want – no restriction. Drink only water, coffee or tea. Do not eat bread, pasta, or grain of any kind, no potatoes, corn or other starchy vegetables. No sugar, candy, soda or alcohol. 1 day/week – cheat like a mother. Eat/drink anything you want. Fully Equipped gym including barbells, plates, squats racks, dumbbells. 14-16" Box or bench for hippity hops and step ups and a Sandbag: 60# for men. 40# Sandbag for women. "Grind" = work briskly, not frantically through this circuit for 15 minutes. Parts (2) and (3) - go as hard and as fast as possible. Stop and rest if needed, but keep working for the entire 60 second interval. Record your final reps. To calculate today's reps for Part (4). 30x Step Ups @ 16"
"Grind" = work briskly, not frantically through this circuit for 30 minutes. To calculate today's reps for Part (2). You scored 33 Kettlebell Floor Press Reps on SESSION 1. Today, do 10x Kettlebell Floor Press each round during part (2). Use the same method to determine your reps for the Renegade Rows.